Mazda Canada’s new ad, promoting the MX-5 RF convertible, uses a camera to track in real time the number of times someone turns their head to look at the image. Billboards are designed to catch your eye. But one ad in Toronto right now is looking back at passersby. A new ad from Mazda Canada Inc. is promoting the MX-5 RF convertible with a real-time counter, using a camera to track how many heads have turned to look at the image of the car. But the digital sign displayed in the underground retail concourse in Royal Bank Plaza downtown is more than a neat – and creepy – trick. It's also a sign of how the "out of home" ad-signage business is trying to evolve. It's the first time Pattison Outdoor has done a campaign like this on any of its signs. The ad agency, J. Walter Thompson Canada, created it with the help of Pattison's digital and interactive division, Fourth Wall, which is charged with bringing new ideas to billboards, transit ads and other signage Pattison sells to advertisers. Fourth Wall calls these "smart ads," and they can be triggered by interacting with people looking at them or with other data from the outside world. Fourth Wall has created ads with an image that flutters in the wind when a train arrives in a subway station and a campaign for Audi with ads that react to the weather – promoting the car's handling in snowy conditions during a storm, for example. 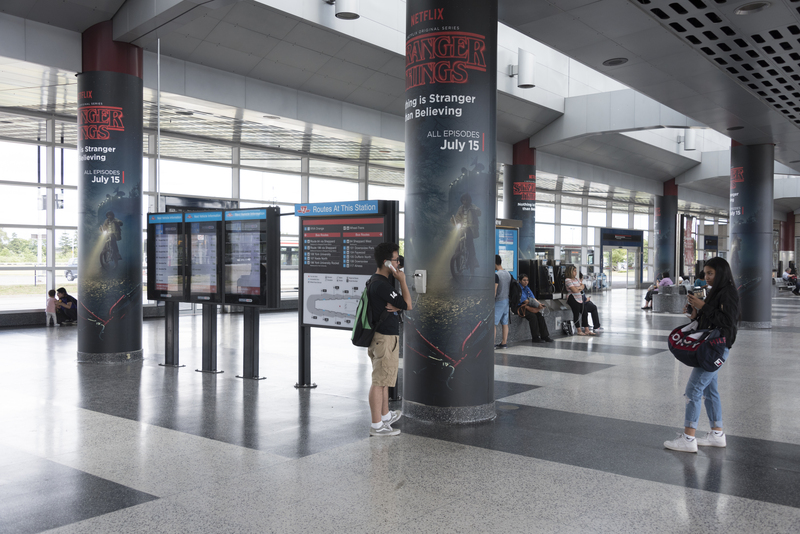 In the summer, the company installed phones in Toronto subway stations to draw attention to ads for the Netflix show Stranger Things. The phones were retrofitted to connect to a computer that would make them ring every three minutes and would deliver a spooky message if someone answered the call, to fit with the show's horror-movie homage. "If you're appealing to a person with something that's contextual, as opposed to something that they have no way to relate to, the campaigns are more effective," said Dmitri Melamed, Fourth Wall's vice-president of production. "You can actually say something that is far more relevant. … There's so much more appeal to that than a broad message." It's not the first billboard to incorporate a camera watching its watchers: In September, another out-of-home company, Cieslok Media, installed a camera on its billboard in Yonge-Dundas Square in downtown Toronto to promote the Oliver Stone movie Snowden. The ad played on the movie's subject matter – surveillance – by broadcasting images of people walking through the square in real time, as if viewed through a security camera. For the Mazda ad, Fourth Wall installed a camera connected to pattern-recognition software in a computer 15 metres away, to detect when a person is in front of the sign and when they turn to look at it. The sign also had to be programmed to receive real-time changes to its "heads turned" counter as the camera recognizes a look. To address privacy concerns, the camera does not store any of the images it captures, according to the company. "We want to make the user more immersed in the ad campaigns, while being extremely cognizant of privacy, and cognizant that many things could simply be creepy," Mr. Melamed said. "We don't want to be there." Now that many signs are digital as opposed to paper and board, out-of-home companies have been experimenting more with ads that change based on the time of day, weather or other data to add context and specificity to the message. "Some of these technologies that are at our disposal can make this quote-unquote traditional medium really exciting," said Ari Elkouby, vice-president and creative director at J. Walter Thompson Canada. "As an agency, we try to do that with every medium we deliver – whether it's print, television, billboards. We don't look at any of them as old hat. Every day there's a new technology emerging, and a way to put a new spin on an old medium." Why is my Mazda3 burning so much oil?